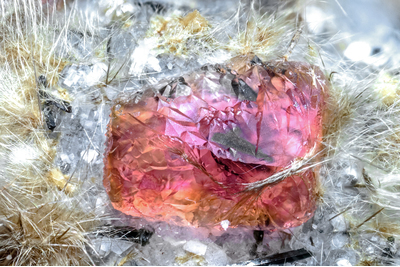 In the middle of tufts of acicular crystals, thin, shaped like hair, of tuperssuatsiaite, a crystal of villiaumite, of pink color, in the central part, to mutate in orange in the peripheral part of crystal. Collection and photo of Gianfranco Ciccolini. Nikon D610, bellows, Schneider Kreuznach 28mm; f:4. Focal using 5.6.